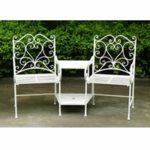 Perhaps it’s known as a garden love seat to couples but singles might refer to it as a garden companion seat, so don’t feel like you have to be in love to sit in the love seat. 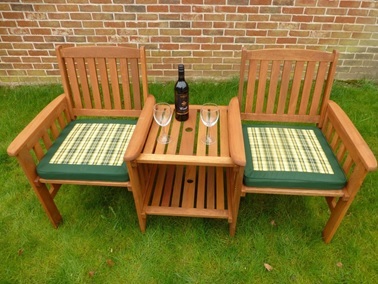 Nonetheless, a garden love seat is simply two garden chairs joined together by a small table. It’s perfect for relaxing in the garden and the accompanying table allows you to put a drink, food or anything else on top of. Since it doesn’t fold away, it’ll probably have to be left out in the garden unless there’s enough room in the shed, conservatory or garage. If it’s to be left out in the garden, we recommend covering it with a waterproof love seat chair cover to prolong its life. Alternatively, a 3 seater swing sofa is also ideal for relaxing, however it’s larger so it’ll require more space. 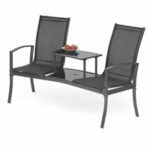 A more space friendly option would be a beach deck chair, as this folds away taking minimal space but it doesn’t give the same modern twist to your garden like a companion garden seat would. 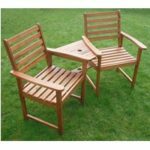 Although some may argue that you can’t really choose a best garden love seat, it’s more of a preference and how it matches your other garden furniture. Well that is partly true, however there can be a few additional features that might make your matching garden love seat an even better match, which we’ll mention below. Also not everyone will have a preference as some people just want the most for their hard earned money! If you’re one of these people then our guidelines are tailor made for you. 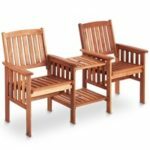 Material – Pick the material type according to your preference, though there are different types of wood, generally a basic wooden garden love seat would usually be one of the cheaper materials. Parasol hole – Insert your garden parasol here to get some shade and protection from the sun. Table tiers – Some of the tables will have a top and bottom tier. The bottom tier will be very handy for putting things like newspapers, magazines and books on, assuming you’ll more than likely have a drink on the top tier. Cushions included – Sitting on a solid material like wood or iron for a while will definitely start to hurt your backside and make you feel uncomfortable. Reduce discomfort by adding a cushion, unless one is already included. Dimensions – If you’re thinking about putting it in a shed, then check the dimensions to see if you have enough room. 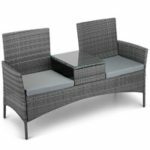 You also might want to consider a curved garden love seat to fit in certain areas better. Modern twist to your garden. Takes up less space as opposed to if it was all separate pieces of furniture. Table that joins the chairs together is perfect to things on top of within easy reach. Concept of it being a “garden love seat” might help some couples bond. Would cost less to buy it all separately. Unable to separate the chairs. You have to buy separate cushions since most don’t come with any.